We love burgers on the grill and eat them at least once a week during the summer. 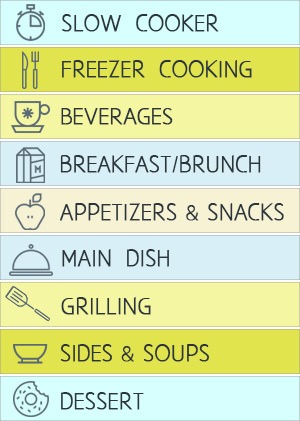 But instead of a plain old burger, I like to add flavors and different ingredients to create a more interesting meal. Last week, I added my homemade fajita seasoning and topped with peppers and onions grilled in a hobo pack. The result–the chicken fajita burger was delicious! 2. Combine the ground chicken, fajita mix, lime juice, garlic, & cilantro. I found it easiest to mix with my two clean hands, but remember you are dealing with raw chicken, you must wash hands well after handling the meat. 3. Form into 7-8 burgers. Spray or brush both sides of burgers lightly with olive oil. 4. Create a hobo pack by placing the peppers and onions in the center of a piece of foil, large enough to fold up into a packet. Before folding up the packet, drizzle the peppers and onions with about 1 Tbsp. olive oil and sprinkle with salt and pepper, about 1/4 tsp each. Fold the packet up tightly, so juices don’t drain out when you flip the packet while grilling. 5. Place burgers and hobo pack on the hot grill. Grill one side for 6 minutes. Flip burgers and hobo pack and grill the other side for another 6 minutes or until burgers are done. The internal temperature of the burgers should reach 170 degrees. 6. Top the burgers with the peppers & onions and your other favorite fajita toppings when serving. such as avocado, salsa, & sour cream. 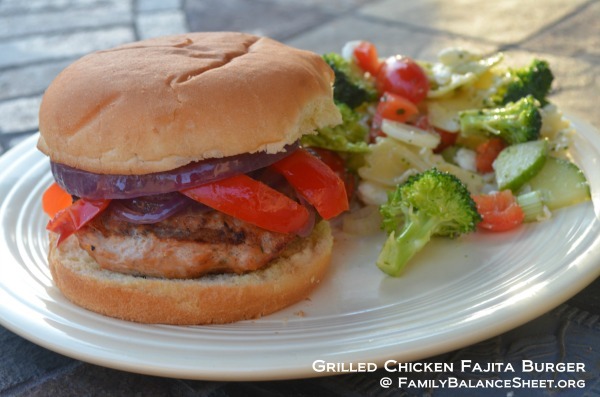 Print recipe for Grilled Chicken Fajita Burgers.